Quo Vadis Clarinets was formed out of a collaboration of its members at Northeastern Illinois University. The group’s repertoire does not hold borders taking on original repertoire as well as arrangements of well and less known works. The group has performed at a number of venues, most recently Chicago's Make Music Festival, Chicago Chamber Music Competition, NEIU Polish heritage Celebration, and St. John Cantius Foundation Fund Raiser. Its members are professional musicians and educators active in the Chicago Land Area. Drichmond Alvarez (Bb Clarinet) is pursuing a Bachelors degree in music Education at NEIU. 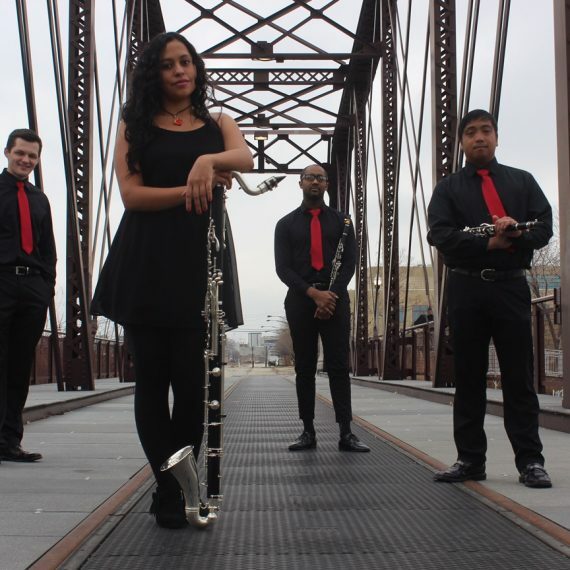 Drichmond is Active in Chicago's Jazz scene. Gloria Inez Orozco Dorado (Bass Clarinet) recently has Earned Bachelors degree in clarinet performance from University of Cauca, Colombia. She has performed and took part in Master Classes in Colombia, United States and Netherlands. Currently she is pursuing Masters Degree in Applied Pedagogy at NEIU. Konrad Pawelek ( Bb and Eb Clarient) is a Graduate of Northeastern Illinois University where he earned a Bachelors Degree in Music education and Masters Degree in Applied Pedagogy. Konrad currently is on faculty at Chicago Highschool for the Arts. He is an active performer in the Chicagoland area and maintains a private teaching studio. Asher Waldron (Bb Clarinet) is a graduate of Stetson University in Central Florida where he earned a Bachelors of music in Clarinet Performance. Currently he is pursuing Master Degree in Applied Pedagogy at NEIU and has worked with several performing arts non profits throughout the city.